The Omnian expeditionary fleet sails for the faraway place they called “the wall.” The worlds of humankind have consolidated their resources to create a powerful armada to confront the alien federation. 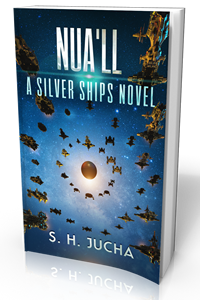 During the Omnians’ previous encounter with an alien fleet at the wall, the Nua’ll comm sphere spoke to them in multiple languages. When the messages were deciphered by the SADEs, humans’ digital friends, the Omnians realized two things. One, they would face a vast empire composed of hundreds of races, and, two, the Nua’ll were not the leaders of the federacy. They had spoken of masters. Multiple challenges faced Alex Racine, the Omnian leader, to cobble together the fleet he required. The Confederation, which was composed of many colonies, could produce ships, but most of its people lacked the will to fight. Haraken and New Terra were single worlds with limited production capability, but they produced individuals, who were anxious to deliver a blow against the federation. A debate raged over whether humans should flee, wait, or fight the onslaught of giant spheres, which ravaged humankinds’ worlds, and the probes which spied on them. It was Alex Racine’s choice to confront the master race. Anything less was only delaying the inevitable. The Omnians knew little about what lay beyond the wall, where the federation’s enormous empire lay, and Alex knew he couldn’t defeat the federacy in a long series of protracted engagements. He had a plan to attempt to conquer and divide. He just needed to find the right sentient race for his idea to work. The MP3 and CD audiobook versions available on Amazon and Audible.